Posted on January 10, 2017 January 10, 2017 , in Swim Spas. If your workout routine is becoming repetitive, investing in a few swim spa accessories can expand your workout options and keep you motivated. 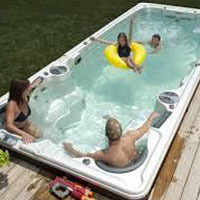 There are also many swim spa accessories that can enhance your swim spa experience. Below, you’ll learn about the many accessories you can use with your swim spa to take your fitness and relaxation to the next level. Swim spas are a great place for strength training. If you want to build muscle tone, invest in a set of wet bells. These lightweight dumbbells that can be used underwater are easy to grip and safe to use. They work with the water’s resistance to create a challenging weight lifting experience. Wet bells cost just $30 per set. If you’re swimming at your swim spa’s maximum resistance level but don’t want to purchase newer, more advanced jets, a tether can be a great training tool. This belt with elastic cord attaches to you and is also secured behind you to increase resistance and give you a harder workout. If you’ve used resistance bands on dry land, aquatic exercise bands are similar but designed to be used in the water. Often used for rowing, they can also be used for a wide range of other resistance exercises to help you build strength and flexibility. Relaxation, safety, and convenience can all be improved by incorporating a few new accessories. If you’re in need of shade while you relax, consider adding a sunbrella to attach to the side of your swim spa. Or if entertaining is a large part of your life, try out a smart bar that attaches to the edge of your swim spa and provides a flat surface for you and your guests to place your drinks while you relax. For added safety for children and others who struggle to easily enter and exit the swim spa, steps can be a terrific idea. And to make your exit from your swim spa warmer and more comfortable, accessorize with a towel bar. If you attach it to the outside of your swim spa, your dry towel will be waiting for you when you’re ready to get out. Now that you’ve learned about accessories that can transform your swim spa experience, download our free swim spa buyer’s guide to see our full range of available swim spas.